If you've got one, you can give one, or if someone has one, let them know. 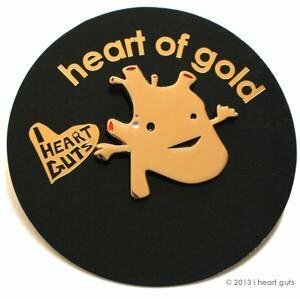 This happy little Heart of Gold pin makes the perfect gift for that really amazingly wonderful person in your life. Comes affixed to a cardboard backing that reads -- wouldn't you know it? -- Heart of Gold. This cute little 1.25" soft enamel pin is made from zinc alloy and comes packed on a decorative card. Faux-gold finish, made in China.